As President Donald Trump and Secretary of State Mike Pompeo watch, a U.S. Navy team moves a transfer case containing the remains of Scott A. Wirtz, Saturday at Dover Air Force Base. At least 19 people were killed in Wednesday's attack at a restaurant in Manbij in northern Syria. The Pentagon identified Army Chief Warrant Officer 2 Jonathan R. Farmer, 37, of Boynton Beach, Fla.; Navy Chief Cryptologic Technician Shannon M. Kent, 35, of upstate New York, and Scott A. Wirtz of St. Louis, a civilian operations support specialist working for the Defense Intelligence Agency, as victims of the bombing. A defense contractor, Valiant Integrated Services, identified Ghadir Taher, 27, of East Point, Ga., as the fourth American victim. She was reportedly a Syrian-born Arabic interpreter. 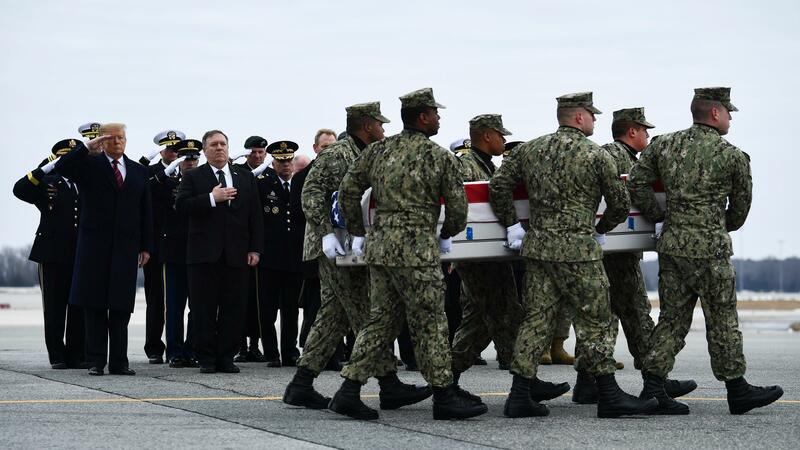 Photos from the ceremony showed Trump and Pompeo looking on as Wirtz's flag-draped casket was carried from a military cargo plane to a waiting van. Three other U.S. service members were wounded in the bombing. This is Trump's second visit to the Delaware Air Force base to witness a dignified transfer, as the return of remains is known. In February 2017, he paid his respects to Navy SEAL William "Ryan" Owens, who was killed during a U.S. raid in Yemen. The Islamic State claimed responsibility for this week's bombing — Saturday's ceremony came exactly one month after the president declared victory over the group. "We have won against ISIS. We have beaten them and we've beaten them badly," Trump said in a video on Dec. 19. "Our boys, our young women, our men – they're all coming back and they're coming back now." As he left the White House for Dover on Saturday morning, he told reporters that the U.S. has been "hitting ISIS very hard over the last three weeks." "ISIS has lost the caliphate, or Islamic State, and almost all the territory it controlled in Syria (and Iraq) at its peak in 2014. However, many fighters are still believed to be in Syria; they've just gone underground. "Many are citizens of Syria and have nowhere else to go. In addition, relatively few foreign ISIS fighters have tried to return to their home countries elsewhere in the Middle East or in the West. The Pentagon and others have estimated ISIS may still have 20,000 to 30,000 members in Syria and Iraq combined. "For these reasons, many analysts believe ISIS retains the potential to mount a comeback, particularly as a guerrilla force waging small-scale attacks." Hundreds of thousands of civilians have died in Syria since the beginning of the conflict in 2011. NPR's Daniella Cheslow noted earlier this week that Manbij, a bustling city of 100,000 people, has faced ongoing attacks from the Islamic State and that "the U.S. has been training local forces to take over patrolling duties — a handover that has been thrust into uncertainty by Trump's December announcement the U.S. will withdraw." Trump announced the trip to Dover Air Force Base early Saturday morning on Twitter. It was followed by a number of other messages criticizing the news media and Mexico, and warning of an economic decline if he is impeached. Later on Saturday, the president made what he billed a "major announcement" regarding border security and the ongoing partial government shutdown – the longest in American history. The announcement included an offer to extend protections for some immigrants brought to the country illegally as children in exchange for $5.7 billion in funding for a border wall.